Previous PostPoison IvyNext PostWe’ve Got Eggs! WOW, Mary I had no idea. So glad your mil is close by to help out. I’ll continue to pray that your healing is speedy! O Mary!! My goodness it looks so painful. I am so sorry. I will keep you in my prayers. Take advantage of your MIL being there and rest as much as you can. Oh Honey. I am soooo sorry. Praising God for your gem of a nutritionist though! I’ll keep praying for your recovery! OH you poor thing! I hope you’re feeling better soon. and I’m so relieved to know you don’t have to try to parent right now. ouch! Girl that looks really sore! I can’t remember where but I read somewhere that plantain is apparently good for things like this. Amy’s last blog post..Witchcraft anyone? OOh Mary Lynn, it looks so painful and uncomfortable. 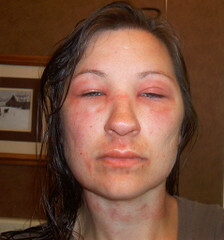 And what is funny is that it looks very similar to what happened to me with my allergic reaction to the “caine” family. Except mine was localized, both times on an arm, first time was the right arm and the second time was the left arm. But you got attacked all over your body!!!! My thoughts and prayers are with you and if you aren’t healing up quickly by 48 hrs. go get that steroid shot because I had to be put on Prednisone which is a steroid and within 24 hrs. it was almost gone, miraculously! Take care! Here’s praying that you will get well soon. Hopefully your body can fight this off! MInTheGap’s last blog post..Who Builds the Body? Mary, it looks like you feel AWFUL!!!!! I am so sorry, and am praying for a quick and speedy recovery for you!! Colleen, thank you! My mil really saved the day yesterday, my nerves were shot and the break/quiet house was wonderful. Jana, you are a blessing, your phone call brightened my whole day! Bless you right back! Jessica, yes, so nice to have family members to pick up the slack. It’s been hard knowing that we had such fun plans for today and tomorrow, kicking off the school year. But we’ll just postpone them till Monday! Thanks for praying! Jan, I so appreciate your prayers and kind thoughts! I *think* I am on the mend…here’s hoping! The speediness of that steroid shot really sounds tempting though! I may not mess around next time…hopefully there is no NEXT time! MIn, thanks…I’m trying my best! Andrea, it is miserable, but another day is almost behind me! Thank you so much for praying for me! Thank you ALL for your prayers! 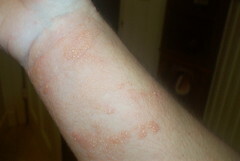 My right arm is much improved, and it was the worst off yesterday…I haven’t even had to apply anti-itch lotion to it today, and it’s not seeping at all. Now to get my fingers back! I feel like I’m wearing rings on all of them, they’re so swollen and bumpy. Ick! Oh Juli, how awful. See, I’ve been thinking this whole ordeal that at least it’s temporary, so many people in this world go through much worse with no hope of relief. I’m SO glad your bells palsey was temporary, it sounds like you hung on to hope as well. Taking up your cross, so to speak. I’m so much better today, and slept fantastic last night, no getting up to reapply itch creams! Today my face isn’t swollen, just blotchy and red as it recovers from the experience. I’m applying aloe vera gel to all the redness, hoping it will hasten the healing process. Nothing itches though! PTL!!! I hope you’re feeling better. I want to share with you that Zanfel Poison Ivy Wash has been clinically shown to be effective ANYTIME after outbreak of the rash. There is no upper time limit where it is “too late” to use Zanfel. Wow! Your pictures reminded me of botox gone bad. I’ll be praying that the treatments work and fast. Wow, I wish the pharmacist had known that! I appreciate so much you setting the record straight! I’ll correct that in my blog ASAP. Thank you for your response to my post. I have some information about poison sumac which is not commonly known and may be helpful to you. If you have a few minutes to give me a call, I will be glad to share this with you. I can be reached by calling 1-800-401-4002, menu option one. I hope you’re continuing to heal up and feel better! Thanks, Dan, I might call you when time allows, I’m sure it will come in handy…hopefully it includes info on getting rid of poison sumac (the plant) forever! 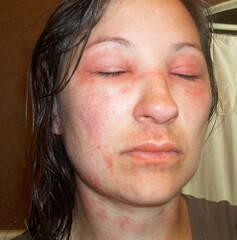 I am going through the same pain,swelling, and itching of poison sumac. My eyes are also just about swollen shut. Like u said cool compresses, ice, and bathes are our friends at this point. Have tried various things and have had two steroid shots and on steroid pills. I know the pain. Oh my, how awful! I had no idea. That’s what I get for taking myself out of the loop! Gina’s last blog post..Loosing Steam!